Following submissions made by the legal team of President Muhammadu Buhari and the All Progressives Congress (APC) at the Presidential Election Tribunal that the presidential candidate of the Peoples Democratic Party (PDP), Alhaji Atiku Abubakar, is not a Nigerian by birth following the plebiscite conducted in 1961 for the people of the present day Adamawa State, questions have been raised as to the relevance or otherwise of the issue to the matter before the tribunal considering that this is an issue that calls the nationality of some and the patriotism of others to the Nigerian nation. Let me start by saying that there is no way a non-Nigerian could have been our vice president, the second highest office of the land, from 1999 – 2007. Subscribing to Buhari’s argument as it relates to Adamawa would mean that Nigeria was recolonised by no more a country than Cameroon. As a Nigerian, this is one fallacy I cannot subscribe to, and it is one fallacy Nigerians must not subscribe to no matter how hard those who are pushing it for their own parochial reasons shove it down our throats. The desperate attempt to rewrite our history by political personalities just to suit their personal interests and narratives, and hold on to power by all means even if it means placing logic on its head in order to confuse the past and convince the present about their shenanigans at the last presidential election cannot work with the people. In December 2014, the All Progressives Congress, APC, cleared Alhaji Atiku Abubakar, to contest for its presidential ticket against the 2015 election. Fortunately, even Buhari himself contested in that primary against Atiku. While Buhari polled 3,430 votes, Atiku who came third in that election polled 954 while Kwankwaso, Okorocha, and Nda-Isaiah polled 974, 674 and 10, respectively. By the virtue of clearing Atiku for its presidential ticket which is meant for Nigerians only, in 2014, APC have lost any moral right to question Atiku’s “Nigerianness”, they, by that action, agree that Atiku is a full blooded Nigerian. Whatever they are doing about it now at the tribunal is nothing but an afterthought, an exercise in futility, it cannot hold water. APC and Buhari cannot now want to deny what they benefitted from in the recent past. They sold their presidential ticket form to Atiku, cleared him as eminently qualified to run for president, allowed him to bring in his enormous goodwill to their party and its presidential primary, and rode on his popularity to clinch Adamawa State in particular and the northeast in general at the 2015 elections, but now suddenly wakes up to claim that the man they so cleared to be their presidential candidate if he had won their 2014 primary is no longer a Nigerian. The law does not allow them to approbate and reprobate at the same time. Another point Atiku’s lawyers must raise at the tribunal is that Buhari himself had on January 1, 1984,after his military coup that ousted the civilian government of Alhaji Shehu Shagari on December 31, 1983, appointed Air Marshal Ibrahim Mahmud Alfa as Nigeria’s Chief of Air Staff. Alfa went ahead to serve in that capacity from Jnauary 1, 1984 to January 1, 1990 (six years). What Nigerians should know is that the late Air Marshal Ibrahim M. Alfa was also from Adamawa State like Atiku and he, like Atiku, was also born before the 1961 plebiscite being referred to by Buhari, APC and their legal team at the tribunal. 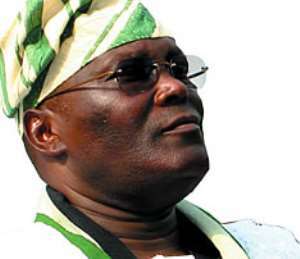 While Atiku was born on November 25, 1946, Air Marshal Alfa was born on August 14, 1946 and died on March 16, 2000. While the Act guiding the appointments of Service Chiefs (Chief of Defence Staff, Chief of Army Staff, Chief of Air Staff and Chief of Naval Staff) expressly states that those appointed must be Nigerians, Buhari, by appointing Alfa in 1984, concedes that indigenes of Adamawa are true and real Nigerians who should enjoy the full rights and privileges of Nigerian citizens including aspiring to the highest office of the land, hence, his appointment of Alfa in 1984 and his agreement to contest with Atiku for the presidential ticket of the APC in 2015. Before Alfa, there was the late Lt Gen Gibson Sanda Jalo, also from the present Adamawa State, who served as Chief of Army Staff from April 1980 to October 1981 and then later as Chief of Defence Staff from 1981 to 1983. Does it then mean that we had a “Cameroonian” as our Chief of Army Staff and Chief of Defence Staff, and even Chief of Air Staff in the case of Alfa as recently as the 80s? The answer is no! President Muhammadu Buhari and his party cannot be done the favour of rewriting our history and injuring the nationality and patriotism of great sons and daughters of Nigeria from Adamawa State. Should the tribunal accede to the submission of APC, it automatically snatches the nationality of these Adamawa indigenes from them in a most violent manner and leaves them stateless, a condition which is not allowed under UN charters. Many Nigerians from Adamawa State born before the plebiscite in 1961 would automatically lose their citizenship in one fell swoop. The tribunal must not allow itself to be used to achieve such a sinister motive against fellow Nigerians just to please the interests of few power mongers. The tribunal must also consider the fact that the 13th and the first female Chief Justice of Nigeria, Aloma Mariam Mukhtar, is also from Adamawa State. Born on November 20, 1944, she was CJN from July 2012 to November 2014. It is a taboo and, indeed, a judicial sacrilege to hear that a former CJN in our recent past, the former boss of the judges at the tribunal, is from “Cameroon”. If there is any arm of government that should know better than those peddling the “Cameroonian” fallacy, it is the judiciary. If Mukhtar from Adamawa State, born in 1944, could be CJN, it is because our fellow citizens from Adamawa are full blooded Nigerians, even the judiciary knows this, hence, the appointment of Mukhtar, and there should be no doubt whatsoever about that. It is abundantly clear that by the virtue of their actions in the recent past, whether singly or jointly, Buhari and APC have always acknowledged that every Nigerian of Adamawa origin is a full blooded Nigerian and cannot be denied their rights of citizenship even if they were born before the plebiscite of 1961. Should we allow political sentiments to override our sense of good judgement, what APC’s submission at the tribunal might amount to is that President Muhammadu Buhari himself, and, indeed, all those born before October 1, 1960, are not Nigerians by birth but only by independence since Nigeria was merely a geographical expression and not a nation until 1960. While it is true that Nigeria, prior to 1960, could qualify for a country, what makes it a nation and distinguishes it from a mere country or state, is its independence and sovereignty as defined by the Black Law’s Dictionary: “A community of people inhabiting a defined territory and organized under an INDEPENDENT government; a SOVEREIGN political state…” (emphasis mine). Going by Buhari and APC’s assertion on Atiku, and the universal definition of what a nation is, Buhari himself cannot claim to be a national of Nigeria by birth since he was born before 1960 when Nigeria became “independent” and a “sovereign political state”, a nation. He cannot benefit from what he aggressively contests. However, the crux of this piece is to expose the hypocrisy of those who labeled Atiku a “Cameroonian”. Rather than deflect attention of the world from the meat of Atiku’s petition at the tribunal, Buhari and APC should redirect their focus on the points raised by Atiku. That is the only path that can clear their names from the mess the 2019 presidential election was believed to be by a majority of reasonable Nigerians as a result of the desperation of those who seek to be in power by all means and against the people’s will. Running helter-skelter and from pillar to post scouting for extraneous items to distract the tribunal and Nigerians from the real issues will only worsen their case and their rating before the people as a majority who before now stood on the fence are now beginning to believe that for Buhari and APC to have travelled this route, and avoiding the germane questions Atiku raised at the tribunal, they surely have skeletons in their cupboard and a a case to answer. While Buhari and his associates are renowned for their constant divisive statements, policies and actions against parts of the country depending on the selfish agenda they wish to accomplish at the detriment of national interest, this “Cameroonian” balderdash is one that must not be allowed to stand. We are all Nigerians and no person or group of persons must claim to be more Nigerian than others. It is time for the judiciary to save the nation! This author has authored 96 publications on Modern Ghana.